This past September we were fortunate to enjoy a trip through Japan led by stereographer Takashi Sekatani. In the heart of Kyoto we found Happy Bicycle, a shop featuring wire scupted bicycles. When in Kyoto drop by there, otherwise check out their website at http://happybicycleman.jimdo.com/. I shot this in their shop using a Fuji W3 with Cyclopital macro attachment and a blank 8-1/2" x 11" piece of paper for backdrop. Because of the pink and light green, it wouldn't have made a good color anaglyph image, but works well as either a half-color anaglyph or a Dubois anaglyph. 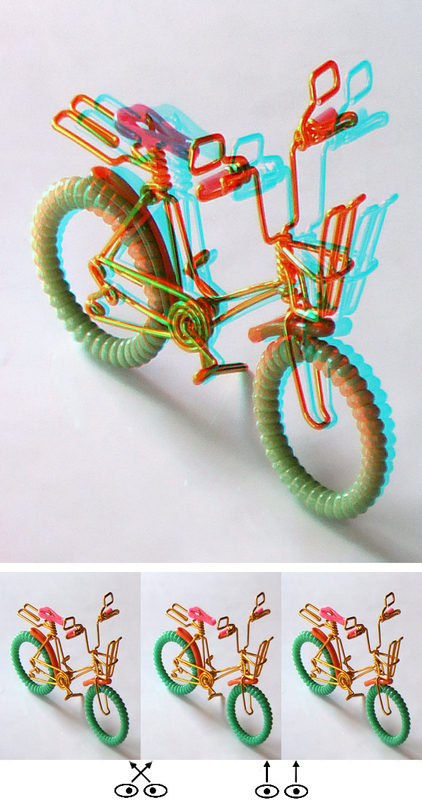 These options and more are available with StereoPhoto Maker, a great tool created by Masuji Suto, for anyone intersted in 3-D imagery. Download SPM for free at http://stereo.jpn.org/eng/stphmkr/.